YOUR INTENSIVE CARE HOTLINE - My Critically Ill Husband is in the ICU Again Due to Septic Shock. Will His Dialysis and Inotropes Cure Him? In this week’s episode of “YOUR QUESTIONS ANSWERED” I want to answer questions from one of my clients Eva as part of my 1:1 consulting and advocacy service! Eva’s husband had cardiac bypass surgery, had a stroke in the ICU, is now on inotropic support and Eva is asking why does the ICU team keeps the MAP (mean arterial pressure) of only 55? Patrik: Do you know about EF, ejection fraction? Eva: Just what I have learned about here. Eva: So, I get numbers that vary between 20 and 30 percent. Patrik: Okay. Is he currently on medication such as dobutamine, dopamine or milrinone? Have you heard of those medications? Eva: They had him on Milrinone. They have taken that off. He’s still on… Dobutamine is the same as the… I’m sorry I couldn’t answer right. Patrik: No, no. The Dobutamine is very much like Milrinone. They are very similar. I tell you. I’ll give you the short version. Dobutamine and Milrinone strengthen the contractibility of the heart. Patrik: Where are the norepinephrine is a more vasoconstrictor and pumps blood toward the heart. They did have him on Milrinone to begin with. They were able to wean him off of that. But they still have him on a fluctuating dose of the Norepinephrine that goes between kind of 1.9 up to well, it kinds… When he falls asleep his blood pressure really drops. Eva: So that’s when they have to increase and add a little of the vasopressor. Otherwise, during the day it has been sitting at about 1.9. Eva: His blood pressure, his MAP, they have a MAP goal of fifty-five. Eva: It’s often a little bit higher. Fifty-five. Eva: Although. So, so, does that make sense to change the goal while he is still on dialysis and needs? So what they have been telling me is that they have to get him off all this artificial blood pressure medication and I said…but then how do, how does he support himself. And they said he just does. Patrik: Well, here’s what I argue, Eva. And that of 55 is almost non-compatible in the long run with adequate kidney perfusion. Okay, now you could argue the number 55 while he’s on dialysis might be sufficient, you could argue that. Okay, at the same time yes they do want to wean the Dobutamine and Norepinephrine and what not but they won’t be able to wean him, they might be able to wean the Norepinephrine with a goal of a MAP of 55 but a MAP of 55 in the long run is not enough. Here is another thing Eva, that’s important to understand. With the sepsis, I would bet he’s on antibiotics? Eva: He has been. I think they end today. Eva: He’s been – The ones that he’s on? Patrik: Yeah, do you know what he is on? Eva: Can you tell me some? Patrik: Okay, he could be on- He could be on Tazocin. Eva: He was on Septra and something else. Eva: I think, sorry I can’t tell you. Eva: He was on too much. Patrik: Don’t worry about it. And they cleared the pneumonia already, do you know? Eva: It is clearing. X-rays show it is clearing. The lungs are doing better. Certainly his diaphragmatic breathing that he was doing last week, I noticed today that that has pretty much stopped. Eva: What they had said was that 40 percent of his oxygen was going just to breathing so they talked about using the BIPAP with him. Eva: He only gave it like a 3 breath trial and then he said no. And that was it. Patrik: Who said no, your husband? Your husband said no? Patrik: Okay, fair enough, fair enough. Okay the reason I’m bringing up, I’ll tell you why I’m going towards the antibiotics and sepsis because it is important to understand. Patrik: That combination of the septic shock and the heart attack is always leading to inotropic support, right. Now when you put someone on dialysis that reduces the blood pressure even further. Eva: Aww, yes. So I see where you are going. They should have a MAP goal of 65 right now to help the kidneys with their perfusion, while he’s on these inotropic drugs and try to get the kidneys working. Patrik: Very much so. Very much so. Eva: Does that make sense? That’s why I’m bringing it up. Eva: So I… Yeah, I didn’t understand that. Because dialysis lowers your blood pressure it doesn’t make any sense to take him off blood pressure medication while he is still on dialysis. Patrik: Correct. Correct. And also, with the dialysis there could be another issue with that his haemoglobin is low. Do you know what I mean by that? Eva: It is. It has been, he actually, the filter has clotted numerous times and so he has lost blood that way. A couple of days ago he had another two units of blood. Right now it is sitting around 100 but it went down as low 65. Patrik: Okay and has he had some red blood cells? Eva: He did. He did two units a couple of days ago. And that put it right back to about 100. Patrik: Okay. Good. And most likely it would have reduced the need to Norepinephrine at least for a short time. Eva: I think it did actually. Patrik: So, that’s the bigger picture. With the ejection fraction so low, how, obviously they are painting doom and gloom picture. Have they ever mention? Let me ask this, is there a cardiologist involved? Eva: I haven’t seen him. There may have. The one who actually did the quintuple bypass. Patrik: That would be the cardiac surgeon. Eva: Yeah, he has not been here. I mean he’s in the hospital, that’s whose ward we were on, he has not been part of rounds or part of the planning. Patrik: Right. Okay. Okay. Is your husband in a big hospital? Is it like, you mentioned Perth. Is he in the big teaching hospital or a big metropolitan hospital? Patrik: Are you aware of a therapy form called ECMO? Eva: Yeah, he had ECMO. Yeah. Patrik: He had ECMO, Right. How long ago was that? Eva: Which caused the stroke. Patrik: Because he was on heparin. 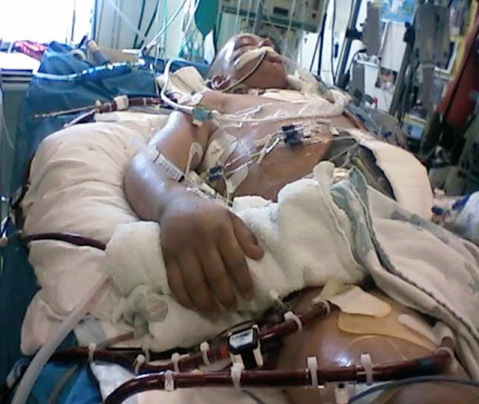 CASE STUDY: MY BROTHER IS IN INTENSIVE CARE AFTER STROKE AND CARDIAC ARREST, HE’S OFF THE VENTILATOR NOW, WILL HE GET OUT OF ICU ALIVE? Eva: That allowed the clot to pass through and the debris as well. Patrik: Oh my goodness. Oh my goodness. So but that is the idea. Eva: So he is on heparin and they are actually talking about using more heparin. Eva: So the CRT doesn’t clot. Patrik: How long was he on ECMO for? Patrik: Four days and that was in January or in December? Eva: That was in December. Patrik: Okay. At that stage, did they bring up what the goal was for ECMO? Do you know what the goal was? Just to get him through the initial heart attack or did they for example mention a bridge to an LVAD or to even potentially a heart transplant. Did you know what I am referring to here? Eva: No, they said he was not eligible for a heart transplant because he had a stroke. Patrik: With his stroke is he talking? Is he confused? Is he with it? Eva: No he has some weakness but, he’s actually regained more of his motor function even while he has been really, really sick. So, his hand function is not totally back. He was sitting up at the side of the bed before we had this relapse, he’s got strength in both legs. He has no kind of facial droop. He’s speaking although with a quiet voice because he is so dehydrated all the time from dialysis. So the stroke I think is the least of his problems. Patrik: Okay. Okay. When your husband was out of ICU, did they mobilise him? Was he out of bed? Did he start walking again? Eva: He was at the side of the bed. That was about as far as we got. They had talked about getting him to stand up the next day. He had already been in hospital for four weeks by that point and had only really been moving for about a week maybe 10 days. Prior to that, before that, he was there was very limited movement. Eva: And they don’t know that because they are brand new. Eva: They haven’t even seen his file. Eva: But that doctor was brand new too. Eva: She had never seen him before. Patrik: Right. Right. And this is where it gets tricky. When patients, if your husband got out of ICU and they would have never seen him again, no one would have talked about your husband. Given that he had ECMO and what not and now he is bouncing back and he’s going back on life support with the Dopamine, Dobutamine, Milrinone and Norepinephrine as well as the dialysis they are sort of saying his time is up. Eva: That’s exactly what they are saying. Patrik: Without giving him another chance. Now do you have any indication at the moment that they are not doing everything that they can. Now I can tell you with what you have shared so far I don’t have any indication but there could be other things happening. Do you have any indication that they are not trying the best that they can? Eva: Because I don’t know I can’t tell you. Eva: I don’t know what the long term plan is. I know what the short term plan for the day is. But I don’t know where that’s leading. Eva: 65 while he is, I got to say that most of the time it is up around that time. Eva: Or up around that number. Eva: So I actually think the nurses are maybe ignoring it. Patrik: And they may because they have probably been told to ignore it. They probably have been told to ignore it. Do you know whether your husband is making any spontaneous urine at all? Eva: The last time they ultrasound there was only 12, but he didn’t while he was on the dialysis last time either. It was not until he was off that it started. They didn’t leave him on so long last time. Patrik: Blood products, which is important, you know. You mentioned he’s on Dobutamine and Norepinephrine, he’s on dialysis, and they tried the BIPAP. My only concern is that they wouldn’t potentially ventilate him. But I’ll talk to that a little bit later. You know, and I want to give you some perspective there. But for now I just want to quickly look ahead. Have they mentioned quality of life? Have they used that term? Eva: Oh yeah. Big time. Patrik: Right. You know where… You know. It’s very different for you, it’s very different for me, it’s very different for the doctor. Everybody has a different perception of it. Eva: And he used the words, you were a very independent gentleman. Is this where you want to be? Patrik: And he’s doing that with… What’s your husband’s response to that? Eva: Well, he said yes I’m very independent. This is the first news that he had gotten of this and he’s, at the end of the day when he had spent all day working, sitting up, and the doctor just appears out of nowhere and lays all this on him and then says think about it and I’ll be back tomorrow to see what you decide. Patrik: Yeah, yeah. And this doctor, this is the very first time your husband meets this person? No I shouldn’t say that. The doctor talked to Frank on Monday. But I was not present. Eva: So I’m starting to fear there is a lot of talking to him when I am not present. Eva: They don’t allow me in and then people are going in and having conversations with him. Patrik: Okay. Okay. And that needs to stop. Eva: I’ve tried to – They are telling me I can’t stop it. Patrik: Well, who did you say you had involved? Eva: The patient care, quality care people. Patrik: So, there’s a few things here. The long term outlook for your husband, nobody really knows. Right. He might recover. Patrik: I mean ejection fraction of 20 to 30 percent is not great, let’s face it but, you know that doesn’t mean he can’t leave ICU, and it doesn’t mean he can’t hospital and potentially go into rehab right? And again the long term outlook the doctors really don’t know. Nobody knows. Eva: He’s only known him for four days. Patrik: Exactly. Exactly. As you also appreciate by now like this doctor or maybe two doctors and they have quote unquote this end of life talk with your husband. I mean this doctor is a stranger. I mean it takes, you know, people have to build some rapport with people before they talk about such matters. Patrik: So it’s like an ICU story in a hurry. They are in a hurry to get him out of there. They are in a hurry to potentially let him die, and it sounds like it can’t happen quickly enough. Eva: I didn’t know that but I guess we are coming to the end of the second week now. So they gave him two weeks before and now we are coming to the end of the second week again. Patrik: Right. End of the second week in ICU for the second admission. Patrik: Then coming to ventilation. Now that you have shared with me that he’s been on ECMO and I’m sure he’s been through a lot there. At the same time, again, people do recover. What I’m doing, when we come off this call I will send you a link of an interview that I have done with a gentleman about two years ago. He’s 80 years of age, or he was 80 at the time. He must be 83 or 84 now, he is still alive. He was in ICU for about 12 months, and they had written him off completely. PODCAST: The Doctors asked us to stop treatment, but I gave my father in ICU a chance instead! I don’t think the ICU wants to help my mother to fully recover and get off the ventilator. How can I find out? The ICU Team is Stopping Treatment to my Dad in the ICU. Can I Transfer Him to Another Hospital? My sister in the ICU Deteriorates With treatment limitations! What should I do? My Wife Had a Brain Death Test in the ICU. Why Are They in a Hurry to Kill Her?